Having already completed a few easy solo walks over the past year or so, and with a bit of free time over the Christmas break, I was keen to get out on something a little bit more challenging. I had never walked in the Blue Breaks before, but had heard a lot of good things, and its remoteness served as a brightly coloured lure I simply could not resist. 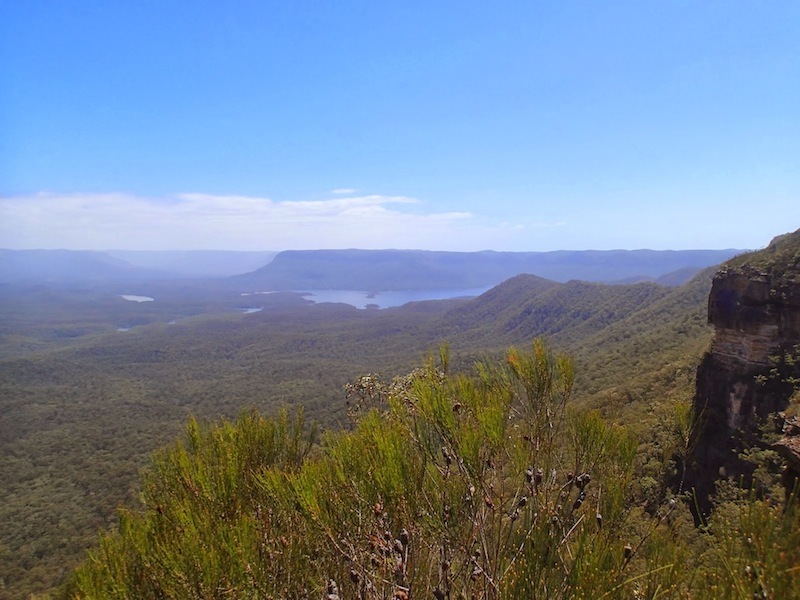 So, when given the opportunity to get a lift out to Kanangra with Jonno for his ‘Two Peaks’ walk, I quickly set in motion a plan for a good bit of remote solo wandering. 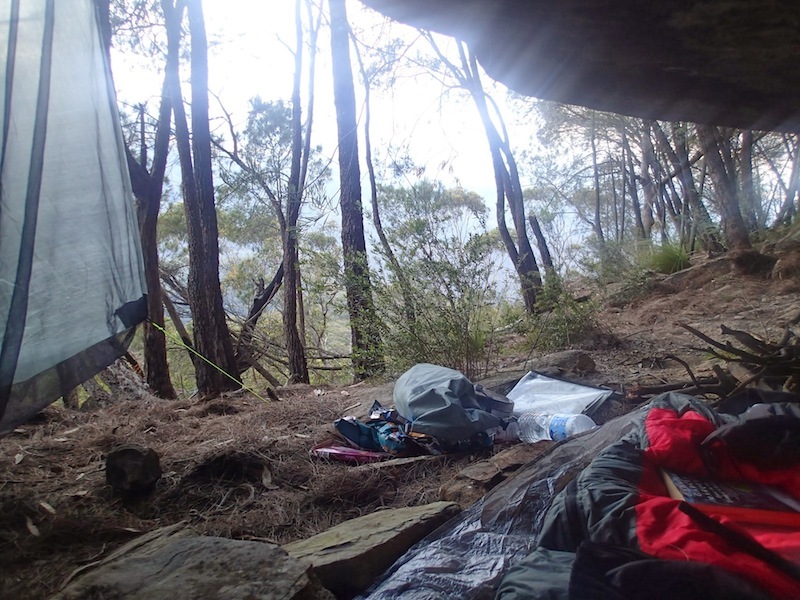 I met up with Jonno in Katoomba on the 26th and we headed out to Boyd’s Crossing to set up camp for the night. At dinner we were visited by a rare spotted-tailed quoll and I later fell asleep under a tree housing a wide-eyed sugar glider. We woke up before 6am, to avoid the heat of the day, and headed along Thurat Ridge to Mount Paralyser. We reached the mountain by about 10am and, madly swatting the march flies that flew drunkenly about us, continued down the steep decent to Thunder Bend. Once at the river we stopped to collect water and have a quick lunch and then headed up another equally steep ridge to the east, to Mount Marooba Karoo. After quite a bit of vertical struggling (mostly on my part), we reached the top and followed a ridge south past Mount Goowong to meet with the track to Mount Cloudmaker. 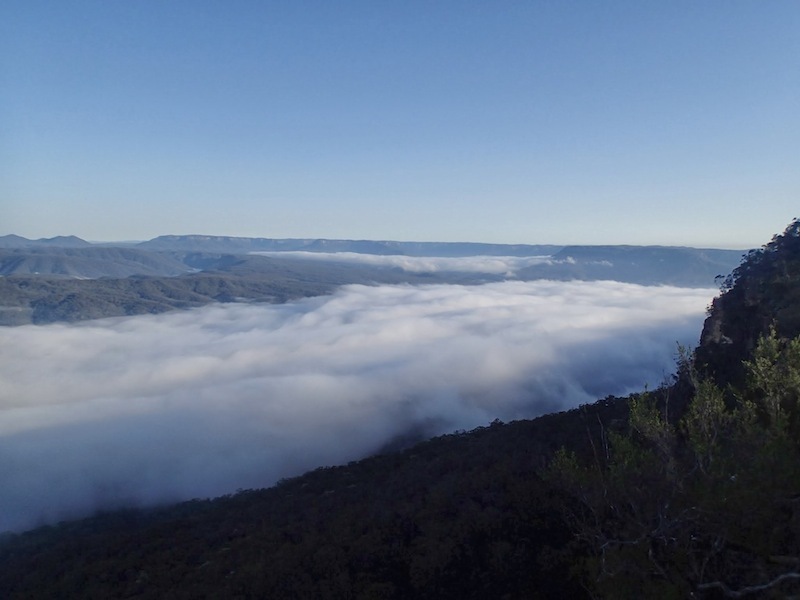 We reached the summit of Cloudmaker by 4pm and after hasty goodbyes, Jonno headed back along the trail to Mount Kanangra while I went down the southern side of Cloudmaker, turning east to reach Ti Willa Plateau. The plateau offered spectacular views to the east and south, and a faint path cut through the dense shrub making movement much faster than anticipated. I reached the end of the plateau at around 6pm and set up camp in a small cave by Compagnoni pass. Today was an incredibly hard day. It was hot, the flies were relentlessly biting and, on many occasions, the scrub seemed alive and hungry, determined to keep me from making much progress. I started walking at 7am and made my way quickly off Ti Willa, and then down to Little Gingra creek. It was empty and as my water had run out, I was very happy to reach the Kowmung by 9am. There were a few red-belly black snakes lazing about by the river, however this did not discourage me from stripping off and bathing in the glorious cool. It was hot and I was tempted to spend more time around the river, but the Blue Breaks were calling and so, after a quick and very early lunch, I made my way up the fire trail to Scott’s main range. The fire trail was completely exposed to the hot sun and I was guzzling through my water like a thirsty camel. On Scotts Main Range I had trouble finding the intended ridge, which would take me directly down to Butchers creek. Thus, I probably took the longest, scrubbiest path, although I did follow some interesting creek gullies that on many occasions turned into miniature chossy canyon-like things. When finally at the creek, I was very happy to find water, and a pool to swim in. 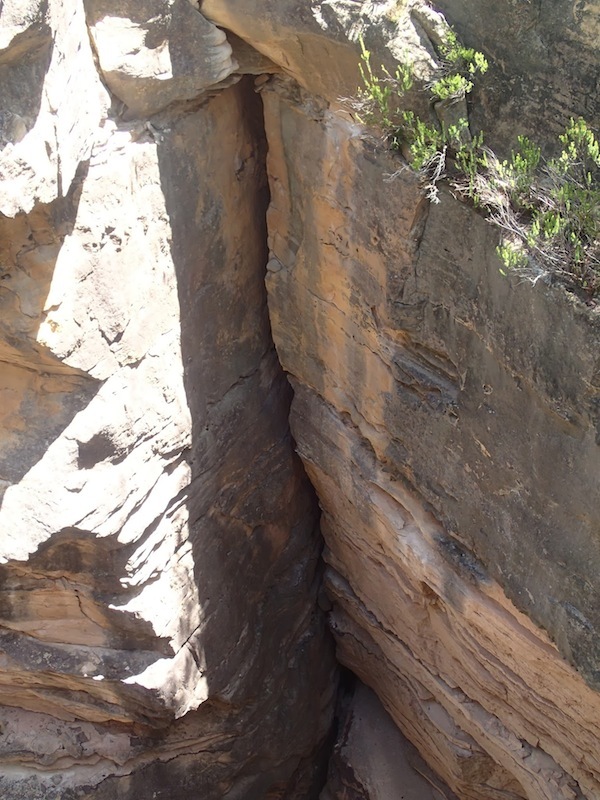 And then, in the heat of midday, I began to thrash my way up Green Wattle saddle. Again, I had trouble with the ridges and had to traverse north across the saddle to reach the southern end of Broken Rock range. I managed to hit every single gully on the way to my goal, resulting in a never-ending, undulating march that sapped the spirit. At 6pm I reached the base of the climb and, although exhausted, and having consumed much of my precious water, I pushed on. I struggled up to the tops, but made good time and so decided to seek out the “good camp cave” marked on Dave Nobel’s sketch map of the Blue Breaks. I pushed on and reached the cave just before dark. I was not feeling that great, but decided to head down a nearby creek (marked as a water source on Dave’s map). I followed it pleasantly for a while, but started to get more desperate and then slightly panicky, as it showed no signs of water. I had been unable to find any water in the rock pools on the tops and had less than 100ml left. It got steadily darker and I started to feel more and more ill; my heart was beating quickly, I was incredibly hot despite the descending coolness of the evening and I had stopped sweating. I quickly recognised the symptoms of heat stroke. Giving up on the creek, I headed back to the cave, set up camp and tried not to throw up (an unfortunate result of heat stroke) for the next seven hours. I was largely unsuccessful. At this stage I was considering getting off the range and heading down to Butcher’s creek to rest and recover, but my mind continued to drift back to SUBW’s motto: “Press on Regardless”. And so, at some point, I walked past what I had aptly named “pikers pass” and sourced the next possible creek on the range. I followed it down for what seemed an age, all the way to where it dropped off the range to the east. I was calm and determined but almost cried out when I saw an incredibly tiny little collection of drops forming at the end of a tricky down climb. Weak with thirst, I slid down the climb and sat patiently for about an hour collecting the drops. Water is gold. For the rest of the day, I continued across the western edge of the range, navigating in and out of scrub as necessary. My progress was incredibly slow, but I had been able to stomach food and was no longer water-limited. 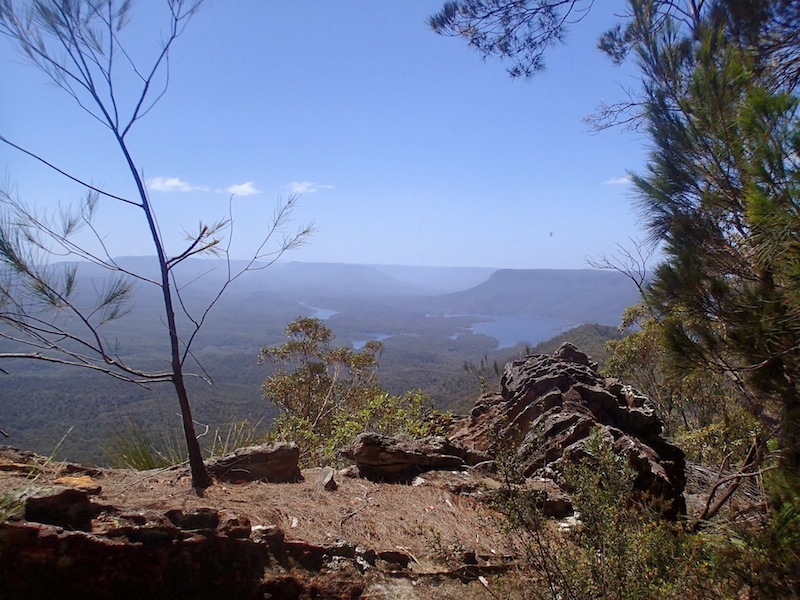 The views were absolutely spectacular, eye-candy for the simple bushwalker. Although I had had a rough introduction to the Blue Breaks, after one look at the rolling green hills, the sparkling aqua blue of the dam and orange sharpness of the rocky cliffs in the distance, I was immediately satisfied. To me, this was a perfect place and I couldn’t have been happier to be sharing it only with myself at that time. When I reached the end of the range, I dropped down along a lovely, clear ridge with spectacular views of the dam. I then made messy work of a series of ridges and gullies leading down to Butcher’s creek, where I camped for the night. The water was not great here. I drunk from a scummy pond seasoned with several dead animals. For the first time ever, I boiled my water before drinking. Last night I was kept up by the playful yips of a pack of wild dogs that had come to drink at the creek. I walked outside to find a set of inquisitive tracks leading right up to my tent: such amazingly curious but polite animals! I headed north-west and back onto Scotts Main Range where I followed the fire trail all the way to the Coxs River. Again, all the side creeks were empty and I didn’t feel like walking down to the Kowmung through the exclusion zone, so I drunk heavily from the main river. Later in the day and for the next few days I would suffer for my drinking choices. Whether it was the Cox or the scummy pool at Butchers Creek, I was visited by some pretty unpleasant stomach upsets. In any case, I rested at the Cox through the hot part of the day, chasing the huge brown trout that swum about in the river and watching a lazy goanna march around the sandy banks in search of food. Although I had been relaxing in the shade, by the end of the day I was feeling pretty rotten (probably from the drinking water) and I decided to head home that night rather than wait to see if my gastro got worse. I started the long, slow march out from the Cox, past Medlow Gap and up onto Narrow Neck via Tarros Ladders to reach Katoomba by about 11pm. Unfortunately, I had missed the last train for the night and so had to wait at the station until about 4am the next morning. I was covered in scratches and probably had a slightly deranged look on my face because the usually obnoxious, drunken teenagers on the platform kept a wide berth from me. But then I had survived the Blue Breaks and in the midst of my dehydration, exhaustion and gastro, I thought, there was very little that could have phased me. This trip was incredibly rewarding for so many reasons, not least of all for the challenges it presented me. I found the Blue Breaks to host an incredibly beautiful landscape, but one that should not be taken lightly with all its remoteness and ruggedness. I love solo walking but now realise how difficult and dangerous it can really be and will never take for granted the help and comfort that can be provided when you walk with others. In any case, I look forwards to visiting the Blue Breaks again soon, maybe with a few good friends, after a bit of rain and in any other season but summer.